Technology is at the heart of how businesses compete and succeed today. But to truly help, technology solutions must be designed for businesses’ real-world challenges and opportunities, not hypothetical or synthetic workloads. That’s why Intel partners so closely with software developers to deliver solutions optimized for our latest hardware platforms – these solutions provide a real competitive edge to businesses from the device edge to the data center. With dedicated resources spanning more than 20 countries, business relationships with over 7,000 independent software vendors, and a robust engagement program that reaches nearly 20 million software developers, Intel fuels worldwide innovation on the latest computing, storage, and communications technologies. We can see the benefits today with the new Intel® Xeon® Scalable platform and the impressive array of software that supports it, achieving big impacts right from day one. Enterprise software vendors include: Altibase, Aerospike, Cerner, Epic, Exasol, IBM, Intersystems, MariaDB, Microsoft, NariTech, NRI, Qliktech, SAP, SAS, Shenzhen Kingdom Technology, Shenzhen TYDIC, TAC, Sunjesoft, Tencent, Thomson Reuters, VMWare, Yonyou, and more. Cloud and communications providers include: Alibaba, AsiaInfo, Baidu, Envivio, Huawei, Kakao Corp, Kingsoft, LeTV, Neusoft, Pixar, Tencent, Qihoo, and more. High-performance and technical computing developers include: Altair, ANSYS, Broad Institute, Cadence Design Systems, CD-Adapco, Convergent Science, CST, Dassault, FIO, Illumina Inc., Intes Software, LSTC, MentorGraphics, MSC, Paradigm, San Diego Supercomputer Center, Sandia Corp, Schlumberger, Synopsys, and more. Though all Intel® architecture-based software runs “out of the box” on our new processors, every new Intel architecture processor introduces new features that can further increase performance, as well as security and agility capabilities. That’s why with each new generation of our processors, Intel partners with thousands of software developers globally to optimize their solutions for the newest platforms. One example is IBM DB2*, which proves that massive scalability and throughput can turn the deluge of data facing every organization into actionable insights that create an opportunities to deliver new customer experiences while fueling business growth. 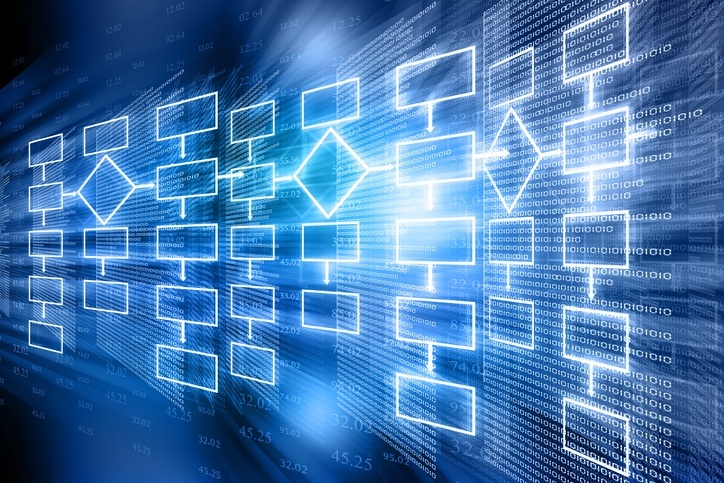 The newly-optimized relational database management system gains a tremendous performance advantage from Intel Xeon Scalable processors. For two-socket servers, refreshing the database platform and the server hardware together drives a performance increase of more than 1.8X1 from the previous software and hardware. 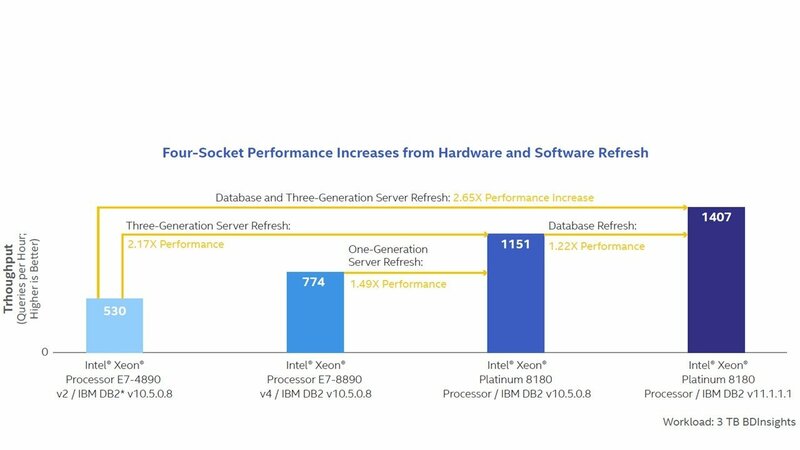 For larger-scale solutions based on four-socket systems, upgrading the server platform from a system just one generation old processors delivered a performance increase of nearly 1.5X,2 and upgrading database server solutions from just three years ago yielded a 2.65X2 improvement. Aerospike Database* provides another great example. Whether detecting fraud, updating trading positions, driving hyper-personalization, or bidding for ad space, the instant a user lands on a website, Aerospike must reliably handle Web-scale data volumes and provide decisions at millisecond speeds without escalating costs. Many of the world’s most successful Internet businesses, including Adform*, Appnexus*, BlueKai*, and Kayak*, rely on Aerospike’s low latency, high throughput, and massive scalability. 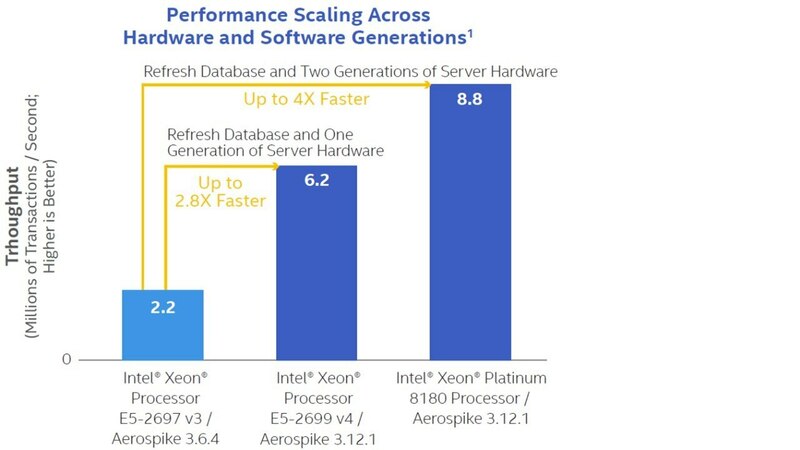 Software enhancements designed for the new Intel® Xeon Scalable processors in the latest version of Aerospike Database help achieve an astounding 4X3 performance improvement when refreshing both the hardware and software. But the competitive advantage of Intel Xeon Scalable processors extends far beyond database management systems. In the communications industry, AsiaInfo is the largest business support system (BSS) provider in China and the second-largest in the world. Their BSS realized performance improvements of up to 41 percent4 from the Intel Xeon Scalable processor. Moreover, configuring those system with SSDs based on Intel® Optane™ technology increases performance further, providing an increase of up to 2.21X4 over the baseline system. AsiaInfo realized an additional hardware-enhanced security performance boost of 1.29X4 from enabling Intel® QuickAssist Technology (Intel® QAT), which delivers scalable hardware acceleration that helps AsiaInfo speed up operations related to encryption to protect sensitive customer data. Technology disruptions happen faster today. Digital transformation is unfolding across every industry, prompting every business to rethink how it will bring new services to market rapidly, and how to out-innovate competitors. The investment Intel and our software developer partners make in optimizing solutions, saves end customers countless hours in validation, deployment and management time as they take the fullest possible advantage of the latest Intel® technology. Visit our ISV solutions hub at www.intel.com/XeonSoftwareSolutions and visit www.intel.com/XeonScalable to learn how you can harness solution based on the Intel Xeon Scalable processor—a new foundation for agile, multi-cloud data centers, fueling actionable insights, security without compromise, and real-time service delivery for businesses and consumers. Workload: 300 GB BDInsights, 12 users, geomean of three runs; performance metric: queries per hour (QpH). BASELINE: 2x Intel® Xeon® processor E5-2699 v4 @ 2.2 GHz; 256 GB DDR4-2400 RAM (16x 16 GB); Intel® SSD DC S3700 Series (800 GB); Red Hat Enterprise Linux* 7.3; BIOS: 86B.0271.R00.1510301446. NEW: 2x Intel® Xeon® Platinum 8180 processor @ 2.5 GHz; 384 GB DDR4-2667 RAM (24x 16 GB); Intel SSD DC S3700 Series (800 GB); Red Hat Enterprise Linux 7.3; BIOS: 86B.01.00.0412.020920172159. Workload: 3 TB BDInsights, 12 users, geomean of three runs; performance metric: queries per hour (QpH). BASELINE: 4x Intel® Xeon® processor E7-4890 v2 @ 2.8 GHz; 1.5 TB DDR3-1600 RAM (96x 16 GB); IBM XIV storage; SUSE Linux* Enterprise Server 11.3; BIOS: 86B.0038.R02.1307231126. INTERMEDIATE GENERATION: 4x Intel® Xeon® processor E7-8890 v4 @ 2.2 GHz; 1.5 TB DDR4-2133 RAM (96x 16 GB); Intel® SSD DC S3700 Series (800 GB); Red Hat Enterprise Linux 7.3; BIOS: 335.R00. NEW: 4x Intel Xeon Platinum 8180 processor @ 2.5 GHz; 1.5 TB DDR4-2667 RAM (48x 32 GB); Intel SSD DC S3700 Series (800 GB); Red Hat Enterprise Linux 7.3; BIOS: 086B.0119.R05.1701181843. BASELINE: Aerospike Server Enterprise* 3.6.4 , CentOS* 6.7, kernel version 2.6.32-573.3.1.el6.x86_64, 2 Intel® Xeon® processor E5-2697 v3, 128 GB DDR4-1866, regular DIMM, 2x 10 Gb network Intel® Ethernet Controller X540-AT2 not bonded, no disk used – in memory workload. NEXT-GENERATION: Aerospike Server Enterprise 3.12.1, CentOS 7.2 with kernel updated to 4.4.59, Intel® Xeon® processor E5-2699 v4, Intel® Turbo Boost Technology and Intel® Hyper-Threading Technology enabled, BIOS SE5C610.86B.01.01.0016.033120161139, 128 GB DDR4-1866, 2x Intel® 82599ES 10 Gigabit Ethernet Controllers (all four ports on the two network controllers were bonded for an aggregate 40,000 Mb/s bond). No storage – in-memory workload. NEW: Aerospike Server Enterprise 3.12.1, CentOS 7.2 with kernel updated to 4.4.59, Intel® Xeon® Platinum 8180 processor, Intel Turbo Boost Technology and Intel Hyper-Threading Technology enabled, BIOS SE5C620.86B.01.00.0412.020920172159, 384 GB DDR4-2666, 2x Intel 82599ES 10 Gigabit Ethernet Controllers (all four ports on the two network controllers were bonded for an aggregate 40,000 Mb/s bond). No storage – in-memory workload. BASELINE CLIENTS: Eight client systems were used to concurrently submit queries to the servers and drive the workload. The clients were configured as follows: Intel Xeon processor E5-2697 v3, 128 GB of memory, and 10 Gb Intel Ethernet Controller X540-AT2 network. NEXT-GENERATION and NEW CLIENTS: Eight client systems were used to concurrently submit queries to the servers and drive the workload. The clients were configured as follows: CentOS 7.2 with kernel 3.10.0-327, Intel® Xeon® processor E5-2697 v4, Intel Turbo Boost Technology and Intel Hyper-Threading Technology enabled, BIOS SE5C610.86B.01.01.0016.033120161139, 128 GB RAM, 1x Intel 82599ES 10 Gigabit Ethernet Controller. For the BASELINE system, the database was populated with 200 M records of 100 bytes each and benchmarked with the Aerospike Java* Benchmark tool (https://github.com/aerospike/aerospike-client-java). The workload simulated a 95 percent/5 percent read/update ratio. Two Aerospike instances were launched on a single server forming a cluster. Each Aerospike instance was affinitized to a CPU socket and configured to use one of the 10 GB NICs. Each 10 GB NIC had its interrupt IRQs affinitized to a CPU socket. For the NEXT-GENERATION and NEW systems, the database was populated with 400 M records of 100 bytes each and benchmarked with the Aerospike Java Benchmark tool (https://github.com/aerospike/aerospike-client-java). The workload simulated a 95 percent/5 percent read/update ratio. Two Aerospike instances were launched on a single server forming a cluster. AsiaInfo Telco BSS: AsiaInfo Telco BSS workload. OS: Red Hat Enterprise Linux* 7.3. Testing by Intel and AsiaInfo, May 2017. BASELINE: 4x Intel® Xeon® processor E7-8890 v4 @ 2.2GHz (24 cores), Intel® Turbo Boost Technology and Intel® Hyper-Threading Technology enabled, 256 GB total memory (16 slots, 16GB, 1600 MT/s, DDR4), 2x Intel® SSD Data Center Family P3700 Series (2 TB). NEW 1 (FOR GENERAL WORKLOAD BENCHMARKING AND INTEL® QUICKASSIST TECHNOLOGY BENCHMARKING): Intel® Xeon® Platinum processor 8180 @ 2.5GHz (28 cores), Intel Turbo Boost Technology and Intel Hyper-Threading Technology enabled, Intel® C627 Chipset, 384 GB total memory (24 slots, 16GB, 2666 MT/s, DDR4), 2x Intel SSD Data Center Family P3700 Series (2 TB). 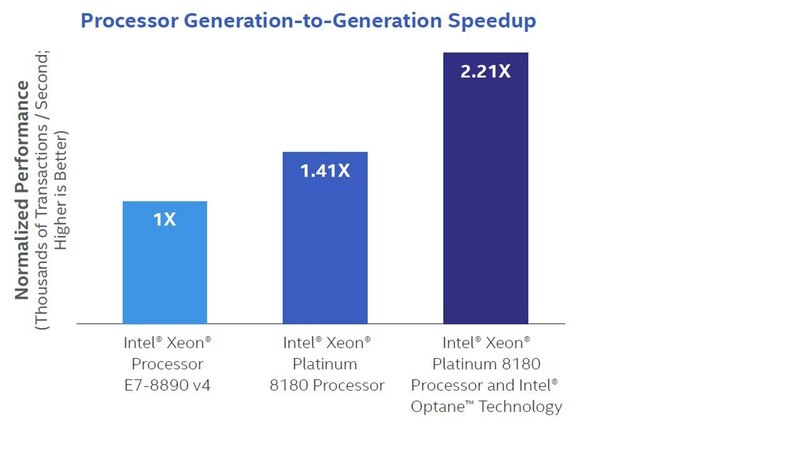 NEW 2 (FOR INTEL® OPTANE™ TECHNOLOGY BENCHMARKING): Intel Xeon Platinum processor 8180 @ 2.5 GHz (28 cores), Intel Turbo Boost Technology and Intel Hyper-Threading Technology enabled, Intel C627 Chipset, 384 GB total memory (24 slots, 16 GB, 2666 MT/s, DDR4), 2x Intel SSD Data Center Family P3700 Series (2 TB), 2x Intel® Optane™ SSD Data Center P4800X Series (375 GB). Tests document the performance of components on a particular test, in specific systems. Differences in hardware, software, or configuration will affect actual performance. Consult other sources of information to evaluate performance as you consider your purchase. For complete information about performance and benchmark results, visit http://www.intel.com/performance. Software and workloads used in performance tests may have been optimized for performance only on Intel® microprocessors. Performance tests, such as SYSmark* and MobileMark*, are measured using specific computer systems, components, software, operations, and functions. Any change to any of those factors may cause the results to vary. You should consult other information and performance tests to assist you in fully evaluating your contemplated purchases, including the performance of that product when combined with other products. For complete information visit http://www.intel.com/performance/datacenter. No license (express or implied, by estoppel or otherwise) to any intellectual property rights is granted by this document. You may not use or facilitate the use of this document in connection with any infringement or other legal analysis concerning Intel products described herein. You agree to grant Intel a non-exclusive, royalty-free license to any patent claim thereafter drafted which includes subject matter disclosed herein. For more complete information about performance and benchmark results, visit www.intel.com/benchmarks. Statements in this document that refer to Intel’s plans and expectations for the quarter, the year, and the future, are forward-looking statements that involve a number of risks and uncertainties. A detailed discussion of the factors that could affect Intel’s results and plans is included in Intel’s SEC filings, including the annual report on Form 10-K. Copyright © 2017 Intel Corporation. All rights reserved. Intel, the Intel logo, and Xeon are trademarks of Intel Corporation and its subsidiaries in the U.S. and/or other countries. *Other names may be trademarks of their respective owners. 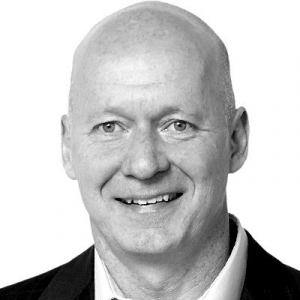 Roger Chandler is the Director of Strategy and Innovation for Intel’s Developer Relations Group. His organization works closely with the global software community to help developers create innovative applications on cutting edge Intel platforms that deliver phenomenal new experiences to end-users. A 15 year veteran of Intel, Roger, and his teams have led: Intel’s worldwide gaming and graphics industry programs and developer evangelism, working with thousands of ISVs worldwide; open source operating system industry innovation for PCs, smartphones, smart TVs, and in-vehicle computing; Intel’s Pentium® Processor roadmap strategy, serving hundreds of millions of worldwide customers; and market development for Intel Internet multimedia software technologies that shipped in hundreds of millions of consumer platforms. Outside of Intel, his interests include outdoor sports, video games, writing, and martial arts. He and his family reside in Portland, Oregon.